A lip balm is usually considered as a winter essential, but what if you get chapped lips all the year long? Even I have noticed people whose lips start peeling off dried skin and remain sore most of the times. The lip balms with balanced ingredients can be their savior for sure. 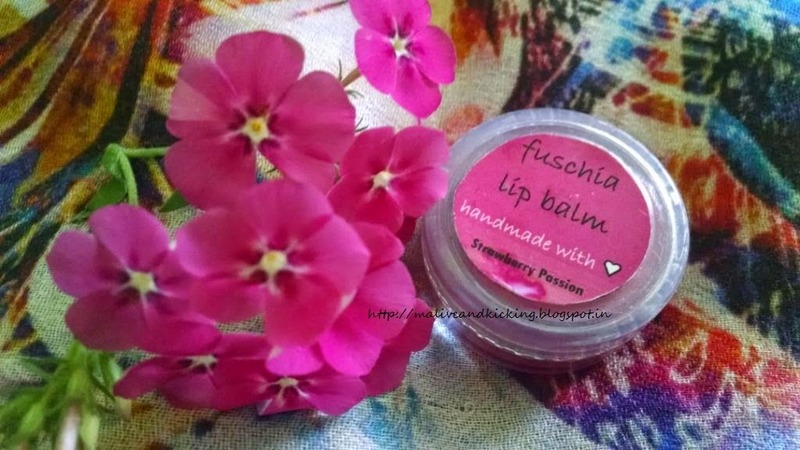 Even if you don't face the problem of chapped lips, I can see that the lip balms are a teen favourite ;) So I am going to review a fruity lip balm from Fuschia today in Strawberry Passion variant..
Infused With 100% Natural & Vegetarian Ingredients. Shea Butter & Kokum Butter Blended With Vitamin E Provide Extra Moisture & Antioxidants. Price: Rs 225 for 8 gm that can be bought here or on snapdeal. The Fuschia Strawberry Passion Lip Balm comes in a small transparent plastic pot with tight screw lid. The lid makes the content safely sealed, and hence the packaging ensures no spillage. 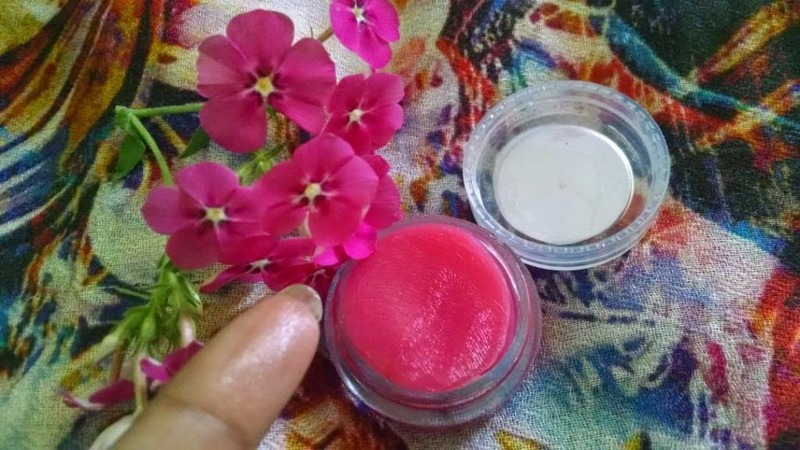 Strawberry Passion is a thick textured candy pink colored lip balm. The bright color as seen in the pot will not lend the same shade on your lips, as it is very very light pink tinted. So when you apply it on lips, the natural colour of lips is more glistened, thats it. And this is the reason that even men can apply it fearlessly. 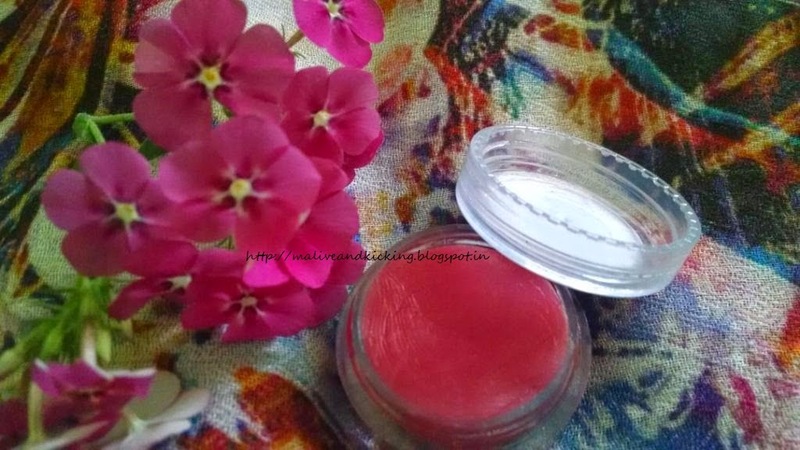 The best thing I like about Fuschia lip balms is that they dont melt even at normal room temperature, and so can be left casually on your dressing table or in your handbag. The brand recommends to use this lip balm on any body part, but somehow I don't feel like applying it on arms, legs or anywhere else. Well Yes! I tried it to soften my knuckles and I found it effective. The lip balm doesn't feel over-sticky, flaky or heavy on lips; yet provides moisture for around 2-3 hrs. So may need to be re-applied twice or thrice. Overall, my lips feel soft, plump and slightly glossy while offering nourishment of Vitamins and natural oils. So I am satisfied with its performance. 2. Can be use as colorless base for Matte Lipsticks. 5. Price at par with many other brands. 6. Does not cause allergy or irritation. 7. Can be used by anyone. 8. Easy Online Availability on many popular websites. 9. Can be applied on any part of body to cure dryness. 1. Packaging can be redesigned in stick/bullet form. 2. Ingredients list should have been printed on packaging. 3. Not seen being sold at departmental stores. 4. Needs reapplication for whole day hydration of lips. Stsarberry is my fav fruit and i really like that flavour in evrything, But it can be applied to any body part, is it true?